Shortly after they became available, I bought myself the new iPad Mini. In my quest to find the best combination of tools to reduce the weight that I carry around whilst providing all the functionality I need on the go, I wanted to see if this new smaller and lighter iPad would work for me. As my iPad2 had a dead microphone and didn't have enough memory (I bought the 16 GB model), I decided on the 64 GB wifi model with the Apple Care Plus warrantee. I did consider the LTE version, however, the data costs were prohibative (Rogers wanted $12/month just to share the 1GB data plan I had with my phone), so I decided to stick with the wifi version and tether with my iPhone if I need data on the go. 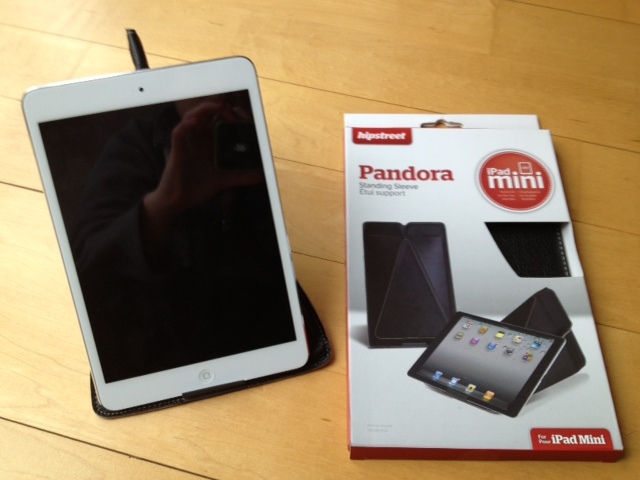 Immediately upon receiving my iPad Mini, I was impressed with how light it is. I also liked how crisp the screen display was. It doesn't have the retina display, but it does have more pixels per inch (PPI) than the iPad2. It also supports Siri, which I find handy, as I hate typing on the iPad. I do find that when I need to type, I type with one finger, rather than trying to touch type on the small screen. Unlike the Nexus 7 (my husband has one), when held in the portrait mode, it is still wide enough to surf the web. I was struck by how I intuitively hold the iPad Mini in the portrait mode, where I almost always used my iPad2 in landscape mode. So far, I love my iPad Mini. Since purchasing the iPad Mini, I also have tried out three accessories: (1) hipstreet Pandora Standing Sleeve, (2) the Belkin portable keyboard case, and (3) the VGA ligthening adaptor. I found the hipstreet Pandora Standing Sleeve at Staples. I didn't purchase the SmartCover because I didn't really like the Smartcover I had for the iPad2, plus it is expensive for what you get. I wanted something that I could slip the iPad Mini into before throwing it into my purse, so that it wouldn't get scratched. I also wanted something that was light, as I did not want any unnecessary extra weight. When I use my iPad Mini, I don't like the bulk added by a case; however, I like the idea of a case that also acts as a stand, for those times when I want to read while sitting at a table. The Pandora Standing Sleeve (at $25) does everything I need, and as an added bonus the case matches my purse! My vote for this case is definitely thumbs up! I typed up the initial version of this blog post using the Belkin Portable Keyboard Case. 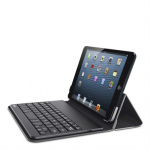 I found with my iPad2, that I had two cases a Smartcover and a Keyboard Case. Depending on what I was doing, I would use one or the other – so I do find that I use both. I want a keyboard case for my iPad Mini for those times when I think I might want to type notes during a meeting or those times when I am travelling without my laptop. I saw the Belkin Portable Keyboard Case in the store and decided to give it a try. It is nice and sleek and small. It is also light weight. The keys do feel nice to type with; however, the keyboard is condensed, and as such it is missing a row. This missing row meant that everytime I went to type an apostrophe I was hitting the carriage return key instead. To get an aposotrophe I needed to use the function key! I was struck by how many times I found myself wanting to use the apostrophe as I typed, and as such, I would not recommend this keyboard. It is going back to the store! There has got to be something better out there. And finally, I can report on the lightning to VGA adaptor. First off, it is expensive at $49.99. Unfortunately, there is no alternative. The connector itself does work remarkably well. I found that the VGA adaptor for the iPad2 was not reliable, as the slightest bump of the iPad cause the connector to come loose. With the lightning adaptor this is not an issue. I was able to successfully do my presentation while holding my iPad Mini, while it was connected to rather long and heavy VGA cable. The lightning adaptor connects so well that I can hold my iPad by the cable and it won't come loose. This makes it a feasible solution for presenting, although I would still prefer to present wirelessly. (3) Thumbs Up for the VGA ligthening adaptor. Oh ya, and a big Thumbs Up for the iPad Mini! The research question – training wheels for new researchers?